The contents of this Register are intended for research purposes only. The heraldic emblems found in the Register may not be reproduced in any form or in any media without the written consent of the Canadian Heraldic Authority and/or the recipient. 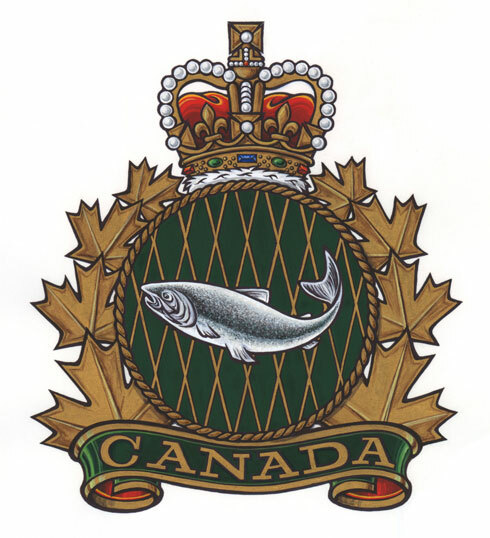 Fisheries Management is responsible for managing the Atlantic, Pacific, Arctic and non-tidal fisheries of Canada, which are represented by the salmon displayed on a fish net over a green background. The eight maple leaves represent the department’s eight management regions when the Hon. Roméo LeBlanc was Minister of Fisheries and Oceans. The Royal Crown underlines the authority under which this work is done.